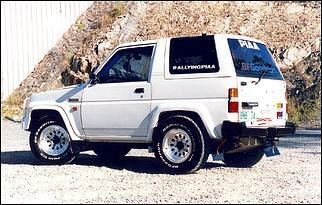 A Daihatsu Feroza with a rally history - not to mention 220hp at the back wheels! This article was first published in March 2001. Ben is the Master of Madness. The object of his madness is none other than this 1991 Daihatsu Feroza - a most unusual choice for the automotive enthusiast. Ben scored this Datswho as his first car about 5-6 years ago - but, interestingly, this wasn't just an average caryard Feroza. 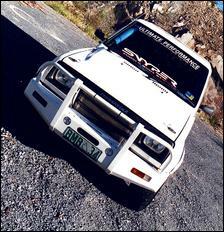 This little monster truck had actually seen many a hard-charging kilometre of the 1992 Australian Safari rally. 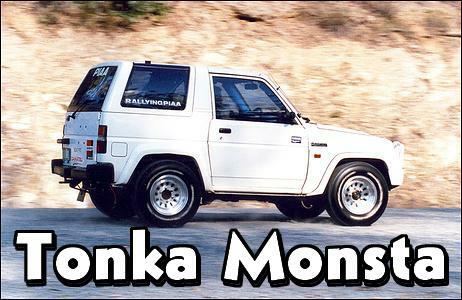 Back in the early '90s, this and ten other Ferozas were officially dropped into competition by Daihatsu Australia; Ben's car being chucked about by the famous George Fury. So there you go - a Feroza with a motor racing background! The transition to Ben's everyday on-road driver has since involved lowered rear leafs, "de-cambered" suspension and tidying up the paint so that it didn't look like a mobile billboard. What he did leave in place from the Australian Safari, however, were the dual shocks (modified slightly), the double-plated chassis rails, the 95-litre fuel tank, the balanced (but otherwise stock) motor and a sturdy 6-point roll cage. Now while Daihatsu did a good job of making the Feroza's 1.6 litre injected SOHC four a reliable little bugger, a high-performance sprinter it is not. George Fury must have taken a calendar with him back in '92! You gottit! 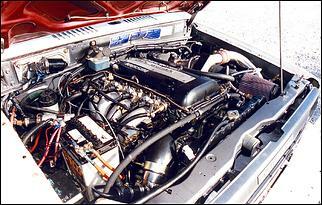 A Nissan SR20 DOHC, 16 valve, intercooled turbo conversion! 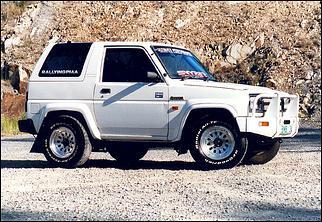 The idea for dropping the top Nissan four into the snout of the off-roader Daihatsu is - of course - somewhat unusual. Ben explains that it was all motivated by "getting ribbed by everyone for its lack of power". As you'd expect, the conversion wasn't a simple bolt-in and fire-it-up. After "ripping the front of the car off", the engine was cradled in a custom set of engine mounts - the same goes for the Nissan 5-speed 'box - and a modified radiator was mounted up. The clutch also needed converting from cable to hydraulic actuation, done using a Hi-Ace master cylinder. With the motor set in place, the journey to the back of the vehicle was conducted with a 2800lb pressure plate/modified full-face clutch combo, and a custom tailshaft (using the standard SR front section). This shaft meshes into a Toyota Hilux differential, which is currently spinning a 4.5:1 open centre. With that kind of rear-end, one wheel burnouts are child's play - though Ben will soon be upgrading to a 4.1:1 LSD along with revised tyre diameters. The engine itself is out of a Japanese market 1997 Nissan 180SX. This means it doesn't have the local 200SX's variable cam timing - but who cares? Ben has brought about is own brand of tweaks! Starting post-combustion, gasses pulse outa the DOHC head into a 316-grade custom stainless steel tubular manifold (fabricated by Ben and a mate from Boat Fix). With near equal length runners (to within about 5mm), this trick manifold was needed to locate a big-sucker turbo. Ben chose to use a roller-bearing hybrid Garrett GT25/30 - which, apparently, pushes max boost by 3500 rpm. With induction air sucking in through a 4-inch K&N conical filter, the turbo boosts to pre-set limits of 9 or 15 psi (switched via a TurboSmart boost controller) and leads into a sizeable front-mount air-to-air intercooler. Using a K&J core as the base, Ben and that same mate have fabricated aluminium end-tanks to suit. The core measures 600 x 300 x 40mm, and it's further cooled by a water spray rig (triggered by a manual dash switch). Also on-route to the engine from the turbo is a Bosch blow-off valve (of the larger variety). This "does the job", but Ben wouldn't mind getting rid of its relentless (and all-telling) "pssht" noise! The exhaust system has also been improved with a 3-inch mandrel piece, with only a cat converter to do the muffling. Because the SR was picked up minus its computer, Ben has had to look to aftermarket injection to get the SR firing. He picked a MicroTech MTX8, which uses an internal MAP sensor. The standard direct-fire ignition - with a coil directly atop each plug - is kept. After its latest tuning session at ChipTorque's chassis dyno, Ben's mighty Feroza has come away with around four times more power than he ever got with the modified Daihatsu 1600. 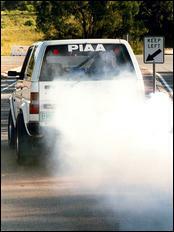 Yes, this Feroza has a genuine 220hp on 15 psi - making this probably the most powerful Feroza in the world! With the mechanicals only very freshly out of the way, Ben has also moved on to re-vamping the interior - he's given the entire cabin a re-trim in grey fabric. This teams up for a cosy-but-purposeful combination with the AeroTech fixed-back driver's seat, dual harnesses, and the competition style aluminium dash that houses Autometer gauges for rpm, water temp, oil pressure and boost... and no speedo. Speedometers, as Ben says, are over-rated! The stereo - at this stage - is a little limited with a Pioneer CD head-unit and Clarion 5¼-inch front splits. It's all enough to make you suddenly feel normal isn't it? !